Bezeq claims 'no warning signs' that employee capable of terrorism - recent interview on national TV suggests otherwise. 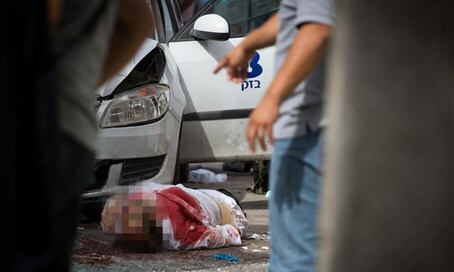 The Bezeq telephone company responded to the car attack conducted in Jerusalem Tuesday by its employee Alaa Abu Jamal, claiming there were "no warning signs" of his lethal terrorist leanings - but an interview he gave just one year ago would seem to prove that wrong. Well before he used his company car to murder Rabbi Yeshiyahu Krishevsky and wound another person - running into passersby with the car and then getting out with a butcher's knife before being shot - Jamal appeared on Yedioth Aharonoth where he gave an interview about the Har Nof massacre last November. Jamal was in fact the cousin of the two terrorists who conducted the brutal attack with hatchets, knives and guns in western Jerusalem, in which four Jews were murdered at prayer - with two of them reportedly beheaded - in addition to a Druze police officer who was also killed in a subsequent shoot out with the murderers. Speaking to the news station in Arabic in an interview broadcast on Israeli TV, Jamal appeared in the black and white khefiyeh associated with arch-terrorist Yasser Arafat, and spoke about the attack. "This act was because of the pressure of the Israeli occupation government against the Palestinian people and Jerusalem in general, and the ongoing harm to the Al-Aqsa Mosque. It's a normal thing that can be expected from every man who has courage and a feeling of belonging to his people and to Islam. It's a normal reaction to the treatment we receive." Asked about the response of the terrorists' families in the southeastern Jabel Mukaber neighborhood, he responded, "the mother of one of the martyrs received the news as normal (i.e. nonchalantly - ed. ), there were calls of joy among us and they passed out candies to the visitors who came, and there was support of the two martyrs." "However, we were surprised by the act and didn't expect it would happen." "Great to die a martyr"
He said of his cousins who committed the terrorist attack: "they were workers and normal people like everyone, in the family we're all like that, workers unaffiliated with any political or other group. Regular working people." "One of the murdered (i.e. one of the terrorists - ed.) was married and has a wife and three kids. We didn't expect it would happen." Asked if he thinks there will be more incidents, he said, "I don't know, everyone is responsible for themselves. We were also surprised by the act." "But you're happy?," asked the interviewer, apparently noting Jamal's wide smirk. The future terrorist immediately responded, "thank Allah, someone who dies as a martyr, that's a great thing." The interview, in Arabic with Hebrew subtitles, can be seen by clicking the image below.